Just as a piano goes "Out of Tune", so do the systems that control a building. It is estimated by Texas A&M researchers that as much as 20% of the energy used in an average commercial building is waste associated with poorly commissioned systems. Lawrence Berkeley National Laboratory (LBNL) and Texas A & M have done seminal work on the typical 10 percent to 30 percent 'drift' in energy consumption that can happen in just the first two years of building operation. The prescription for halting and reversing this drift is regular retro-commissioning. LBNL’s database of over 600 buildings representing around 100 million square feet of floor-space shows that the median whole-building energy savings for retro-commissioning is around 16 percent and the median ROI is 1.1 years. Building commissioning has emerged as a strategy for remedying this problem in non-residential buildings. Commissioning is a systematic process of ensuring that all building systems perform interactively according to the contract documents, the design intent and the Owner’s operational needs. Retro-commissioning (RCx) is a single-instance commissioning of systems in an existing building. 75% - 80% of the buildings that will exist in 2030 exist today and 150 Billion Sq.ft. of Existing Buildings in the U.S. will need to be renovated in the next 30 years. Retro commissioning play an important role in make our building stock energy efficient. On-going commissioning to ensure efficient building operations and measurement-based savings accounting. MBCx is a measurement-based paradigm which affords improved risk-management by identifying problems and opportunities that are missed with periodic commissioning. AB1103 will require that all California non-residential buildings provide a performance rating of their operational energy performance at the time of sale or lease. Many public sector buildings are being required to benchmark on a continuous basis, with goals to reduce energy use annually. The California Energy Commission is drafting regulations. The original proposed draft regulations require the initial compliance to begin on January 1, 2011. However, new proposed draft regulations will postpone the initial compliance date until January 1, 2012. Benchmark (or Benchmarking): When establishing ratings for the energy use and carbon emissions of buildings, the actual building’s energy or emission performance must be compared against some standard or benchmark. The benchmark can take the form of energy use of existing buildings from large data sets of measured energy use or, in the case of new buildings particularly, the benchmark may be a comparison of the simulation estimates of energy consumption against either existing building energy use or simulations of a baseline energy use relative to a particular building code or standard. BuildingSmart – The National Building Information Model Standard (NBIMS) rebranded to be more user friendly and international in scope. COBie - Construction Operations Building Information Exchange - Commissioning information. COBIE is that portion of BuildingSmart that defines the handover at the end of construction of building information to operations. COBIE also includes a framework for tying commissioning reports to the underlying systems from the design. Today, most contracts require the handover of paper documents containing equipment lists, product data sheets, warranties, spare part lists, preventive maintenance schedules, and other information. This information is essential to support the operations, maintenance, and the management of the facilities assets by the owner and/or property manager. Gathering this information at the end of the job, today's standard practice, is expensive, since most of the information has to be recreated from information created earlier. COBie simplifies the work required to capture and record project handover data. The COBie approach is to enter the data as it is created during design, construction, and commissioning. Designers provide floor, space, and equipment layouts. Contractors provide make, model, and serial numbers of installed equipment. Much of the data provided by contractors comes directly from product manufacturers who can also participate in COBie. Commissioning - Building commissioning is the process of ensuring, in new construction, that all the subsystems for HVAC, Plumbing, Electrical, Fire/Life safety, and Building Security are operating as intended by the building owner and as designed by the building architects and engineers. Building commissioning is a quality assurance process for the complexity of modern construction projects. Normally the commissioning firm is involved from project initiation to project completion. 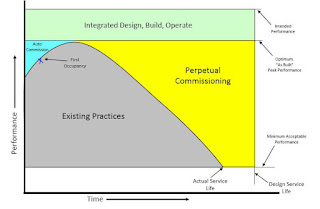 While the service methodology can vary from firm to firm and project to project, the basic formula for successful building commissioning involves a synergy of pre-construction review of design documents for compliance with the Owner's Performance Requirements (OPR), periodic site observations during the construction phase, and systems performance testing as the project nears completion. While the practice of building commissioning is still fairly new in the construction industry, it has quickly become common practice as savvy building owners and developers have seen substantial returns on their investment. The ultimate goal of the commissioning provider is to deliver for the owner a project that is on schedule and under budget, and a building with fully operational and optimized systems on day one. CCx - Continuous Commissioning - This term has been registered (SM) by Texas A&M University (TAMU), who defines it as “an ongoing process to resolve operating problems, improve comfort, optimize energy use and identify retrofits for existing commercial and institutional buildings and central plant facilities.” Specific commissioning protocols are also associated with the term. Change of State - Economical use of memory if changes are infrequent, Captures all cycling. Data represents value at beginning of interval. Equipment Staging - RCx that affect control settings for the availability or staging of duplicate equipment, e.g., Chiller staging and loading sequence or lead-and-lag pumping sequences. Loop Tuning - RCx that modify control loop parameters to improve control by reducing cycling, hunting, and oscillations. MBCx - Monitoring-Based Commissioning - The approach in the UC/CSU/IOU partnership. It involves three elements: 1) Energy Information Systems/Building Diagnostics; 2) Retro-commissioning; and 3) Ongoing commissioning and measurement-based savings accounting using the metered and monitored data. New-Construction Commissioning: Single-instance commissioning of the systems in a newly constructed building (or major building addition), applied from project inception to initial occupancy. Occupancy Determined Scheduling - equipment or lighting - RCx affecting the control of equipment availability as a function of building occupancy (e.g. lighting sweeps; temperature setbacks; morning warm-up). RCx - Retro-Commissioning - Single-instance commissioning of systems in an existing building. Re-commissioning: - Periodic commissioning of systems in an existing building to ensure that systems are operating as intended. RIN 1904 -- AC13 - Final rule establishing criteria for federal agencies that choose to employ green building rating system issued by the U.S. Department of Energy (DOE). The rule covers new construction and major renovations of federal buildings, including certain residential construction, of $2.5 million or more beginning on October 14, 2015. The rule does not specify use of any particular certification system, but rather establishes criteria that promote energy-efficient building designs and that focus on energy and water management. The new rule sets a precedent for active energy and water management by requiring post-occupancy verification of the savings at least every four years. By mandating post-occupancy verification of energy and water savings on a regular basis, the government can be sure that its facilities are performing optimally. The new rule will have a significant impact on federal energy use, as one-third of the energy used by the federal government is in its buildings. The rule supports DOE's goal of reducing building energy use in the United States by 50 percent, as well as the Accelerate Energy Productivity 2030 partnership between DOE, the Alliance to Save Energy, and the Council on Competiveness to double U.S. energy productivity by 2030. Sensors – Accuracy of entire measuring range maintained during heating and cooling control applications? Setpoint Modification (high VAV setpoint minimum, setpoint suboptimal) - RCx that modify the setpoint of a control loop. E.g., Supply air temperature setpoint, thermostat setpoint, or static pressure setpoint. Sequence of Operations - RCx that propose changes significant enough to be considered a major modification to the building’s existing sequence of operations. Despite its benefits, commissioning has yet to achieve widespread penetration – there is still considerable room for growth. A Smart Grid has the potential to accelerate the adoption of commissioning programs, and offers a new opportunity in the form of continuous commissioning. A Smart Grid will allow automatic monitoring and proactive maintenance of end-use equipment, which can be an avenue for energy savings and reduced carbon emissions. Equipment is sometimes not properly commissioned when it is first installed or replaced. With the two-way communications of a Smart Grid infrastructure in place, a utility could monitor the performance of major consumer equipment through advanced interval metering and on-premise energy management control systems. The utility would be able to send alerts to a facility energy manager to indicate if major equipment is not performing up to nameplate efficiency specifications. With this information in hand, the facility manager may then choose to either adjust the operational settings of existing equipment or replace sub-optimal equipment with more energy-efficient equipment to improve overall operational efficiency. Depending on the service agreement, the utility may also offer to send a representative to re-commission the equipment for a customer. The result would be a greater degree of proactive maintenance that would benefit the customer by improving operation and reducing energy costs, and would benefit the utility by fostering enhanced customer relations and potentially reducing peak load. The energy savings would also equate to a reduction in carbon emissions. Energy Savings - Expected to be more robust and persistent for MBCx projects than for conventionally commissioned ones, due to the level of metering and monitoring. Retro commissioning can save 10 – 20% of building operating expenses. EPRI estimates that retro-commissioning could lead to an annual energy savings potential of 2.2 billion–8.8 billion kWh, depending on the level of market penetration. Experience shows that commissioning is particularly cost-effective in large commercial buildings (> 100,000 sf), and can yield overall energy savings of 15% (or 17 kBTU/sf-yr), and electricity savings of 9% (or 1.7 kWh/sf-yr). Sustained Savings - Several studies have shown that RCx savings can degrade without an explicit effort to monitor and maintain them. Retro-commissioning is known to be vulnerable to persistence problems, and thus is a particularly good candidate for a measurement-based approach. Furthermore, certain commissioning opportunities cannot even be identified without the use of measurement. Savings due to Trending Data - Savings from persistence and optimization of savings from RCx due to early identification of deficiencies through metering and trending. Savings from measures identified through metering and trending during the initial commissioning effort i.e. measures unlikely to be found from RCx alone. Examples include: poor control of chilled water distribution to air handlers; unnecessary chiller operation due to disabled chiller lockout; poor VAV zone control due to inoperative actuators on air dampers and hot water valves. Identification of New Problems - Continually identified new measures. 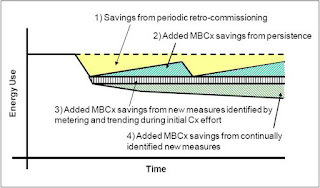 By virtue of the continuous nature of the monitoring, MBCx can identify new problems that emerge after the initial retro-commissioning investigation stage, such as equipment cycling and excessive simultaneous heating and cooling. User Feedback - User behavior and motivation to reduce energy use is influenced by feedback on actual building performance. Validate Green Building Projections - Too much anecdotal information suggests that a fairly large number of high-profile green buildings are using much more energy than their widely published projections. We desperately need more data on actual performance, with random samples, and comparisons of new green buildings to plain vanilla, standard construction buildings serving the same uses as those green buildings. Validate Estimates - Current paradigms based on stipulated or estimated energy savings invite significant uncertainty and thus risk of under-attainment of goals. Shifting to a measurement-based strategy affords better risk-management and also helps to identify problems and opportunities that are missed when only engineering estimates are used. Gaming the System - Recently, there have been a couple of projects where owners pay for two sets of energy models: one to get the most LEED credits, and another with more realistic assumptions about operating conditions for budgeting their real expected energy costs. If this sort of “gaming” grows, our current modeling and reward system is setting perverse incentives. We’ve set expectations and incentives for energy modelers to predict idealized performance, regardless of what will really happen in the building when it’s built and occupied. Ineffective Green Building Strategies - The lack of real, measured performance data on green buildings causes owners and their designers to operate in somewhat of a vacuum, often pursuing technologies and techniques that are not worthwhile. Busy Facilities Managers - It may seem obvious, but the value of a dashboard tool is only as much as the time people are willing to take to use it and the ability of users to understand and follow up on the information they provide. Most facility managers’ time is almost always a triage of which of the daily emergencies is the greatest threat to their job. Once people are looking the other way, typically these folks will go back to the way they have always done things, unless there is deep expertise behind the dashboard to support them. Unfortunately this expertise is not to be found within most dashboard companies, principally because investors have failed to understand, or understand too late, that nothing scales in the building industry without good people. 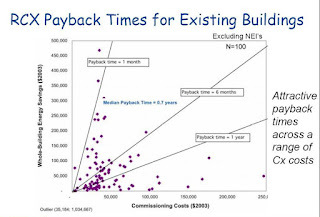 Speculative ROI Baseline - LBNL’s database of over 600 buildings representing around 100 million square feet of floor-space shows that the median whole-building energy savings for retro-commissioning is around 16 percent and the median ROI is 1.1 years. What the LBNL study does not address is how many serious issues are actually discovered by on-site facility folks who provide 'daily' maintenance. The question is, when? Sometimes issues are prevented before they happen through daily maintenance routines, or sometimes they are caught days, weeks or months later. The value of a dashboard is that it could reduce the time needed to discover problems. Tetro-commissioning is designed to find issues that are assumed no one would ever have found in the course of a typical maintenance regime, or that would have at least remained undiscovered for a year or more. Rarely is enough due diligence performed pre-dashboard deployment to understand how well a building or portfolio is performing and therefore what can be saved. The only way an ROI can authoritatively be claimed is if there is perfect future knowledge about what would have happened anyway in the absence of the installation of the dashboard. Since this obviously is not possible, one can only conclude that most, if not all ROIs mentioned in the context of a purchase or sale are self-serving at best. For example, assume a dashboard helps identify a problem with a facility’s load profile. Upon further investigation, it is discovered that equipment has been running overnight unnecessarily because the building operator made an error when programming the building automation system. The problem gets resolved right away. How long would the equipment have continually run had the issue not been discovered? A day? A week? A month? Or would it occur until the next retro-commissioning occurs? 'ROI' would vary by up to three orders of magnitude depending on the answer. Further complicating the issue is that quite often buildings are not performing, or are not being operated, as designed/intended, which means that initial energy baselines established by the energy dashboard may overlook existing problems. Put another way, dashboards benchmark buildings against what is happening, not necessarily what should be happening. If, for example, when the energy dashboard is installed, a site has an air-handling unit that is not being turned off at the appropriate time, it may not exhibit enough energy waste to trigger an alarm. In this case, a typical dashboard would automatically establish an incorrect baseline and trigger an alarm only when energy consumption goes above that amount. Architectural Energy Corporation, Boulder CO, 27-year history of improving the performance of hundreds of new and existing buildings, as well as for its research that has shaped the industry's understanding of high-performance buildings. Provides sustainable design assistance and support with Leadership in Energy and Environmental Design (LEED) certification — as well as an expanded range of engineering services, including building commissioning, retro-commissioning, and measurement and verification. BuildingIQ - Foster City, CA - Sells software for continuous commissioning of buildings, which can then be leveraged later for demand response offerings, as it is currently doing with NV Energy in Nevada. BuildingIQ’s core technology was originally developed by Australia’s National Labs, CSIRO. The company is backed by leading industry and financial investors including Siemens, Aster (Schneider, Alstom and Savoy) and Paladin Capital. Their Predictive Energy Optimization™ uses advanced algorithms to automatically fine tune and control HVAC systems resulting in savings while maintaining or improving comfort. 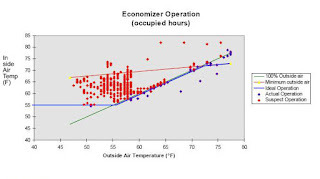 Small changes in temperature and pressure result in customers savings of 10-25% in HVAC energy costs. Trading on the Australia Stock Exchange ASX commenced 16th December 2015 (BIQ.AX). California Commissioning Collaborative - a non-profit 501(c)3 organization committed to improving the performance of buildings and their systems. The CCC is made up of government, utility and building services organizations and professionals who have come together to create a viable market for building commissioning in California. LBNL - Monitoring Based Building Commissioning - This report documents an in-depth benchmarking analysis of energy savings from a portfolio of 24 Monitoring-based Commissioning (MBCx) projects designed to achieve energy and peak power savings in the University of California and California State University system buildings. For the MBCx cohort, source energy savings of 22 kBTU/sf-year (10%) were achieved, with a range of 2% to 25%. Median electricity savings were 1.9 kWh/sf-year (9%), with a range of 1% to 17%. Peak electrical demand savings were 0.2 W/sf-year (4%), with a range of 3% to 11%. The aggregate commissioning cost for the 24 projects was $2.9 million. We observed a range of normalized costs from $0.37/sf to 1.62/sf, with a median value of $1.00/sf for buildings that implemented MBCx projects. Half of the projects were in buildings containing complex and energy-intensive laboratory space, with higher associated costs. A median simple payback time of 2.5 years was achieved for the portfolio. Texas A&M System Energy Systems Lab - Continuous Commissioning - Based on Continuous Commissioning® results from more than 300 buildings, the average measured utility savings are about 20%, with simple paybacks typically occurring in less than two years. Continuous Commissioning® maintains long-term savings using ongoing monitoring of energy consumption with follow-up commissioning, as needed. It also improves system reliability and building comfort by optimizing system operation and control schedules based on actual building conditions, upgrades the operating staff's skills by allowing direct participation in the CC® process, and reduces O&M costs. EPRI – The Green Grid Electric Power Research Institute, The Green Grid: EPRI Report 1016905 (Palo Alto, CA: Electric Power Research Institute, 2007). CEC 2008. 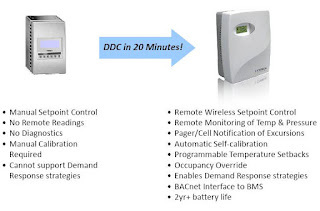 “Savings Persist with Monitoring-Based Commissioning” Technical Brief. California Energy Commission. CEC-500-2008-053-FS. SCE's RCx Program - Provides retro-commissioning services to large customers. Great & interesting article, quite to the point! The blog is very informative. Thank you! The concept of LEED is booming a lot in the construction of new buildings. This concept is very stupendous, as it is helping in guiding and optimizing to design the best buildings with greater efficiency. There are many firms that are nowadays, providing the service of LEED to many architects and builders. One of the recognized company, named as, Spinnaker Group provides LEED energy model to building contractors, architects in Florida.